IRVINE, Calif., Sept. 12, 2011 – The Motorcycle Safety Foundation® recently graduated its six millionth RiderCourseSMstudent, a milestone reached through the ongoing efforts of nearly 10,000 RiderCoaches at more than 2,000 training sites worldwide. Though it would be impossible to identify the six millionth student, the MSF determined the total number of graduates through its enrollment statistics. "We have RiderCourses across the nation and around the globe, often during weekdays, and virtually every weekend of the year," said Robert Gladden, vice president of the Motorcycle Safety Foundation. "Plus, MSF offers 23 different courses to meet the needs of any level of rider. We congratulate all our safety professionals, as well as the students. They are helping us with one of our main goals of developing good rider character, leading motorcyclists to make better decisions out on the road and in traffic." A wide variety of MSF RiderCourses is made available to every state in order to provide its motorcyclists with lifelong learning opportunities. More than 23 RiderCourses plus other programs make up MSF's comprehensive Rider Education Training System. "Backed by thorough research, MSF curriculum developers create courses to serve the wide variety of today's riders and their needs and interests," said Dr. Ray Ochs, MSF director of training systems. "From the Basic RiderCourse to a much more advanced day on the track, from standard motorcycles to scooters to three-wheel motorcycles, from small bikes to large, we cover it all." Scenes from some of these RiderCourses can be seen at msf-usa.org. MSF-certified RiderCoaches receive continuous professional development and are taught how to use the latest educational methods, emphasizing adult and student-centered learning. Besides facilitating the existing training programs, the Foundation conducts ongoing, leading-edge research that will inform tomorrow's training programs, most notably through the MSF 100-Motorcyclists Naturalistic Study and the MSF Discovery Project. In addition, the MSF collaborates with safety professionals worldwide. For example, the MSF is currently helping establish rider training in the Hashemite Kingdom of Jordan. The MSF works with all branches of the U.S. Armed Services to support riders in the military. And the Foundation also works with world champion road racers on track-based programs that improve rider safety everywhere. "The MSF is still best known for its world renowned Basic RiderCourse, the best first motorcycle ride for any new street rider and the cornerstone of the MSF's Essential CORE curriculum," said Tim Buche, president of the MSF. "We want all riders to start with the BRC, then continue their education with the Basic Bike Bonding, Street RiderCourses and more." The Motorcycle Safety Foundation promotes safety through rider training and education, operator licensing tests and public information programs. The MSF works with the federal government, state agencies, the military and others to offer training for all skill levels so riders can enjoy a lifetime of safe, responsible motorcycling. Standards established by the MSF® have been recognized worldwide since 1973. The MSF is a not-for-profit organization sponsored by BMW, BRP, Ducati, Harley-Davidson, Honda, Kawasaki, KTM, Piaggio, Suzuki, Triumph, Victory and Yamaha. 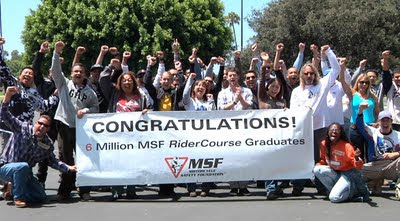 For safety information or to enroll in theRiderCourseSM nearest you, visit www.msf-usa.org or call (800) 446-9227. That's cool. I took the MSF course to learn to ride. They were really good.